Bayne now reading "Annual Report into Internal Audit 2009-2010" -- report says admin policies were inadequate and poorly communicated, and IDed some policies/procedures that needed improvement. Letter reads: "Your duty to reside at all times in Prince Edward Island"
B: So duty to reside means maintaining a residence? The duty is for the person to reside. You mean maintaining a residence as in 'be a resident' then yes. If you mean simply maintain a home, then no. A: Almost always when is a residence, you would need a house... the house doesn't satisfy the duty. Duty is to be resident. It is not to own a residence. B: But in your letter is there any definition of residence? A: No, but there's duty to consult. Bayne now going through Exhibit 9 -- these are other acts and statutes Defence compiled together. Audcent agrees that there are specific definitions of "resident" for each of those acts -- and applying to those acts. B: Each of those acts define what deems/includes/means to be a resident? B: That's in stark contrast for the Senate that doesn't provide any definition of primary or secondary residence? Cross examination continues now about Duffy's travel claims. On form, above signature line reads: "I certify that the foregoing expenditures have been incurred by me on parliamentary functions, as defined in the Senate Administrative Rules"
Bayne asking about SARs on that definition of "principles of parliamentary life". Calls attn to "partisan activities are an inherent and essential part of the parliamentary functions of a Senators." Bayne says partisan activities aren't 'sideshow' but inherent part of Senators' activities. Audcent: Yes. B: What is a partisan activity? // A: Include attending caucus meeting on parl hill, there's conservative caucus, senate caucus, etc. B: Would it include party conventions? A: "Partisan activities would apply to going to party conventions." but parl won't pay registration fees. Audcent says there are "limitations" -- goes on to say it includes during election, and other limits as defined by law, Senate, internal economy committee. B Asks what those limitations are and can't say. B: "You're the law clerk. If you don't know if there are any limitations to partisan activities, who would?" A: "When it comes to financial resources it would be the director of finance." B: Wouldn't that include kissing babies, shaking hands, getting out and meeting people? 12 people in overflow room that sits 100+. All journos. Bayne starts afternoon session... still on the definition of "partisan"
But Senate wouldn't pay Senators for $ paid to political parties -- ie convention registration fees. But Audcent can't point to rule that says that. Bayne asking Audcent to define "parliamentary business/functions" in the SAR. And "public business". Bayne shows A photo June 11, 2009 - duffy and harper - in Cambridge Tells A there's handwriting on it. Can he read it out? 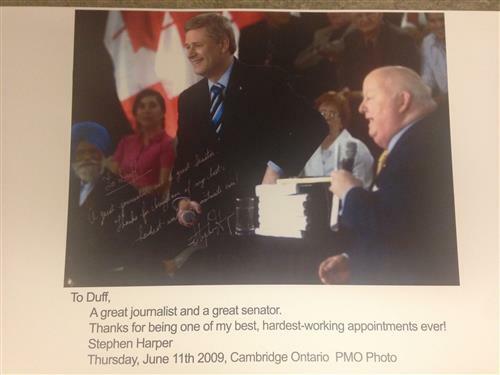 A: "To Duff, a great journalist and a great Senator. Thanks for being one of my best, hardest working appointments ever. Stephen Harper"
A:But harper there was as a member of gov't of Canada. A: "It's public business for a Senator yes"
B: For the G8, is it official business? A: The PM would have had to request it in writing. "It's undoubtedly official." it seems that Bayne is IDing events that Duffy has claimed expenses and getting Audcent to agree it fits with the definition of Parliamentary business. Back from break and now using the "Orientation Guide for New Senators" document... still continuing defining what is "Parliamentary Business".